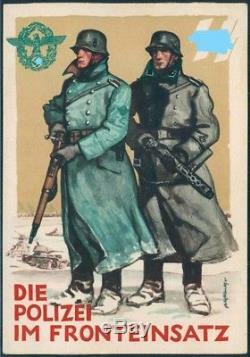 Original poster by Felix Albrecht (1900 - 1980), designed for the Day of the German Police February 14 and 15 in 1942. 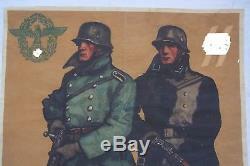 Depicts 2 German policemen at the eastern front, in the background you see destroyed Soviet tanks and a burning town. This poster is very impressive especially for its size. It's maybe the only one still existing. And the German Police Museum. The information I received: For the day of the police they were supposed to print posters in 2 sizes a bigger one, that is mine, and a smaller one plus postcards. But because of the war they didn't have the material to be able to print them all. 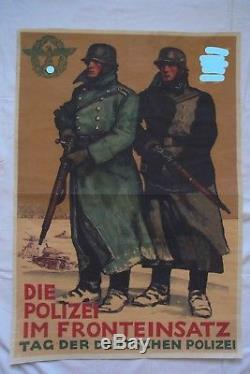 What is interesting, on my poster the policemen, one ordinary and one of the SS, are holding rifles, on the smaller one and on the postcard one is holding a rifle and the other one a machine gun. 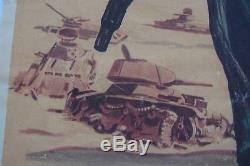 Maybe they printed them first with 2 rifles and later thought it would be more impressive with the machine gun. 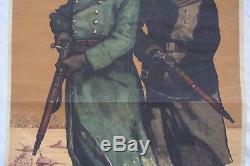 There are existing reprints of the smaller poster, I believe they are out of stock by now. I guarantee the authenticity of my poster. 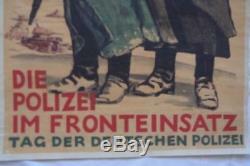 The item "Original Poster 1942 WWII German Police at the front line 23 x 33,5 in. WW2" is in sale since Saturday, April 21, 2018. 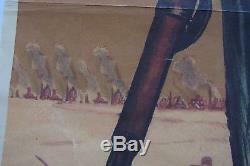 This item is in the category "Collectables\Militaria\World War II (1939-1945)\Prints". 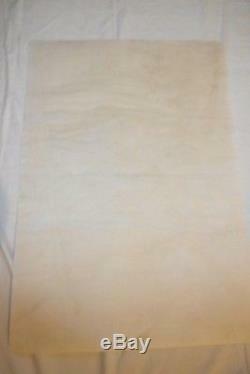 The seller is "kadiska100" and is located in Berlin. This item can be shipped worldwide.